Lauren Gallagher and L. A. Witt: An Excerpt and some EPIC Finalists! 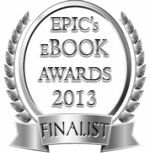 An Excerpt and some EPIC Finalists! So I'm still recovering from GRL, which was a total blast, but had a few quick news updates. I'll be facedown in some edits for a few days, plus catching up on some various books I need to finish, but I'm trying to update my blog more regularly. Being busy is good, but man, it really makes blogging fall by the wayside! Anyway. I've just posted an excerpt from The Left Hand of Calvus, my ancient Roman historical due out November 5th from Riptide Publishing. This book is part of the 4-book Warriors of Rome collection, which includes titles by Lisa Henry, Sam Starbuck, Violetta Vane, and Heidi Belleau. The collection is currently available for pre-order as a group or individually (The City War by Sam Starbuck, He Is Worthy by Lisa Henry, Mark of the Gladiator by Heidi Belleau & Violetta Vane, and The Left Hand of Calvus). Okay, back to editing with me. Lots of stuff in the offing, so check back! Finished The Left Hand of Calvus earlier today. Do you think I can write a review? No way, GAH! !